This blog has made many posts about martyred Salvadoran Archbishop Oscar Romero. Therefore, this blogger is pleased with the news of progress on Romero’s canonization from Super Martyrio Blog that is devoted to obtaining that canonization. The following is a re-posting of the May 20, 2014, post by the Super Martyrio Blog. Thank you, Super Martyrio for this good news. The current Archbishop of San Salvador, Msg. José Luis Escobar Alas, confirmed this Sunday that in his May 9 audience with Pope Francis, he and three Salvadoran Bishops accompanying him discussed the canonization process of Archbishop Oscar A. Romero with the Pontiff. Archbishop Alas described Pope Francis as happy and enthusiastic about the cause and he confirmed the fact, first reported by Super Martyrio, that the Salvadorans are inviting the Holy Father to El Salvador for the canonization. “What we are thinking, what we are asking the Lord,” Msgr. Alas said, “is the prompt canonization of Monseñor Romero, and that Pope Francis come and that it will be here” [in El Salvador]. However, the statement fell short of the huge expectations created when Auxiliary Bishop Gregorio Rosa Chávez intimated last Sunday that there would be a big announcement, bearing exciting news from Alas, leading many to infer that the church was about to announce Romero’s imminent beatification. The latest excitement would not constitute the first false report about an impending beatification from those close to the process. In September 2005, the postulator of the cause, Msgr. Vincenzo Paglia suggested to Vatican reporter John Allen that he was “within a month” of securing Romero’s beatification. Paglia has remained comparatively more tight-lipped this time, not making any statements since reporting last year that Pope Francis had released a hold over the process. 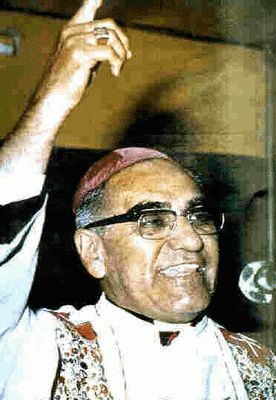 Alas reported that the Pope “demonstrated his happiness, his approval,” of Romero’s beatification, “but he did not provide a date, we understand, out of respect for the very process,” Alas said.Additional details about the Salvadoran delegation’s activities in Rome were revealed last week in the Salvadoran Church’s weekly newspaper, Orientación. In a letter to the editor from Alas in Rome, the newspaper revealed that the four Salvadoran bishops who traveled to Italy for the recent canonizations of Popes John XXIII and John Paul II had met with Paglia ahead of meeting with Pope Francis. “The whole meeting was on the issue of the beatification of Archbishop Romero,” Alas said in his letter. “Archbishop Paglia spoke to us about his knowledge about Archbishop Romero, about the process, and about his activities as postulator. He was very happy with us.”The ecclesial weekly also disclosed the novelty of the Salvadoran bishops’ letter expressing unanimous support for Romero’s beatification. Super Martyrio had previously reported that such a letter had already been sent to the Vatican. However, the previous letter was sent to the Congregation for the Causes of Saints and, the diocesan newspaper reported, the bishops conference had recently concluded that the previous step had been legally insufficient as a matter of canon law, and that it was necessary to direct a letter to the Pope himself. To further bolster the gesture, the bishops decided to deliver it in person. During his Sunday press conference on May 18, Archbishop Alas also disclosed that the Pope had told the Salvadoran bishops during their meeting that he had been similarly invited to visit El Salvador by President-Elect Salvador Sánchez Cerén when the two met in April, also regarding Archbishop Romero’s canonization cause.